Mineral-insulated cable, often also abbreviated to MI cable, consists of a metal sheath and ceramic-insulated internal conductors. 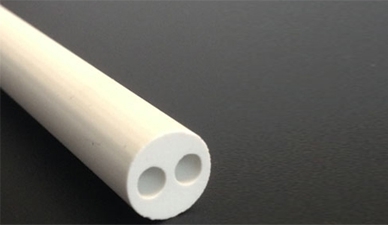 The ceramic is a metal oxide powder (standard material is MgO) with a purity of > 99.0%, which ensures the insulation of the internal conductors from each other and also the insulation of the conductors from the outer sheath. The construction of an MI cable is similar to ordinary cable, however, it has the special feature of high temperature resistance. 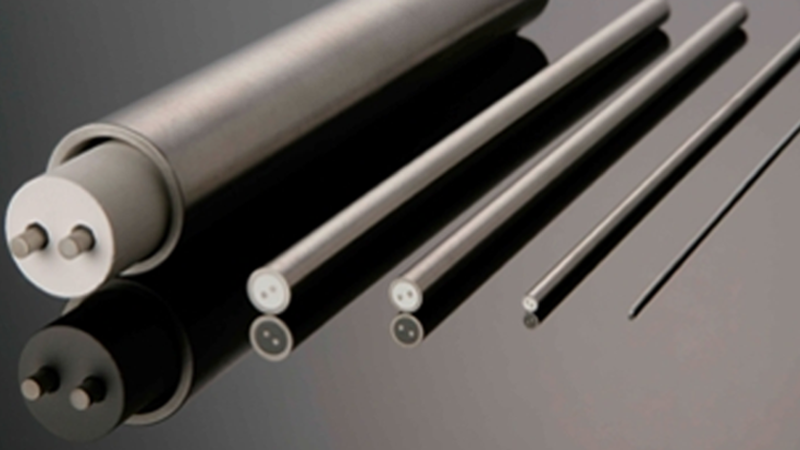 By using stainless steels instead of, for example, PVC or Teflon, application temperatures up to approx. 850 °C (1.4571, 316L, 1.4541) or even up to approx. 1150 °C (2.4816) are possible. The starting point is a long metal tube (typical length approx. 15 m) of the desired sheath material, into which bored ceramic cylinders are inserted. Matching the bores of the ceramic cylinder and the later sheathed cable type, corresponding internal conductors are inserted. For the subsequent construction of resistance thermometers, internal conductors made from copper or nickel are usually used. When constructing thermocouples, the appropriate material pairing must be considered, dependent on the thermocouple type. This overall structure, consisting of outer tube, ceramic cylinders and inner conductors is subsequently compacted by alternately drawing it through carbide or diamond drawing dies and then heating, until the desired diameter is achieved. The compacting of the mineral ceramic to powder ensures a rapid heat transfer between the sheath material and the internal conductors. 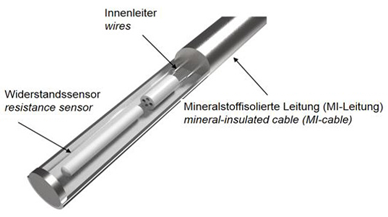 Since only mineral components are used for insulation, operation is also possible at significantly higher temperatures than would be the case with plastic-insulated cables (e.g. PVC, PTFE). Protected by the metallic sheath material, mineral-insulated cables are also fire-resistant and therefore ideally suited for temperature measurement. The diameter of the MI cable is primarily determined by the requirements of the subsequent technical application. The smallest diameter of electrical thermometer ever manufactured by WIKA was 0.25 mm. If this diameter is compared with that of conventional cables, the user is offered considerable advantages when using relatively thin dimensions. The combination of outer diameter, sheath material, wall thickness, number, material and arrangement of the internal conductors and also the accuracy class (only with thermocouple wires) leads to a large variety of different mineral-insulated cables. The special feature of MI cable lies in the relative position of the inner conductors to each other as well as to the outer sheath, which are always constant. Even when the cable is bent or twisted, the position within the composite is ensured. The permissible bending radius is three times the diameter. The defined insulation properties, resulting from the exact positioning of the internal conductors, are fundamental when it comes to the construction of explosion-protected thermometers. With any further processing of the mineral-insulated cable, particular attention must be paid to the hygroscopic characteristic of the insulating ceramic. If this is not guarded against, the cable immediately absorbs moisture from the environment, which, within a few minutes, reduces the insulation resistance. For this reason, the MI cable should only be stored hermetically-sealed or, if open, in a furnace with a correspondingly high temperature. Further information on thermocouples and resistance thermometers can be found on the WIKA website. As a Product Manager of WIKA’s electrical temperature measurement division, I would like to use this blog to inform about our products and technical innovations. Furthermore, there are many interesting problems out of the daily business and possible solution approaches that can be presented in this blog. I look forward to your comments, questions and suggestions.